San Diego Mayor Kevin Faulconer outlined ambitious plans to cut through bureaucracy and combat a dearth of affordable and available housing during his fifth State of the City address Tuesday evening. Faulconer entered the speech at the outset of the lame duck stage of his mayorship, facing a 6-3 Democratic majority on the nonpartisan City Council. He has also been bruised by the city’s 2017 hepatitis A outbreak that killed 20 residents, a convention center expansion plan that fizzled before it got off the ground and his backing of the ill-fated SoccerCity initiative, which voters rejected 67.4 percent to 32.6 percent during the November 2018 election. In spite of the political winds blowing against him, Faulconer described his plans in 2019 to eliminate building height limits, eliminate parking requirements and authorize unlimited housing density provided that developments include affordable housing and housing for homeless residents. All three proposals would be implemented in so-called “transit priority areas,” defined by the San Diego Association of Governments‘ 2050 Regional Transportation Plan as developments within a half-mile of an existing or planned transit stop, planned being the operative word considering that the transportation plan is supposed to be a guideline through 2050. Faulconer then suggested the proposals make his San Diego’s first “YIMBY” mayor. Faulconer critiqued both the county and federal governments for their inaction on mental health issues and partisan bickering, respectively. He argued that local efforts to increase housing availability and affordability are hollow without accompanying mental healthcare specialists and dedicated mental health services, a task Faulconer said falls in the lap of the county government. In addition to his housing proposals, Faulconer put his support behind a transit hub that would connect the city’s public transit to the San Diego International Airport. The city plans to work on the project with the airport, SANDAG, San Diego Port District and Metropolitan Transit System, according to Faulconer’s office. Faulconer reiterated some of his accomplishments during his tenure, like repairing more than 1,000 miles of city streets, as well as long-term city projects like Pure Water San Diego, which would provide one-third of the city’s water supply. Faulconer also doubled down on his support for a community choice energy project, which would serve as a government-controlled energy provider to compete with San Diego Gas & Electric. 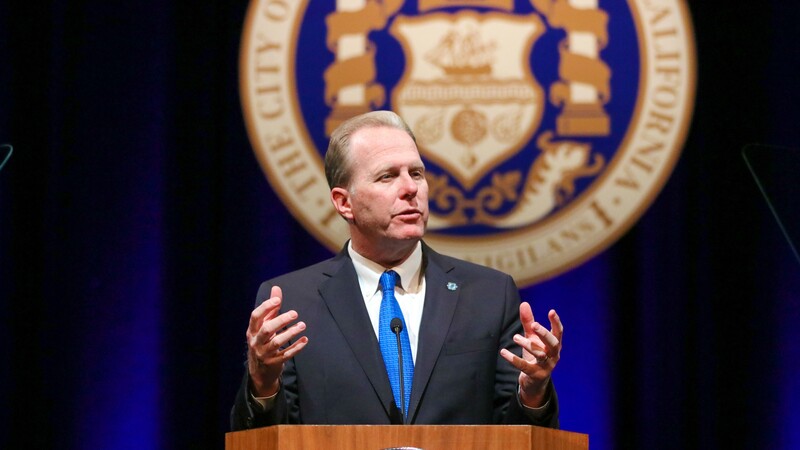 Faulconer closed the speech by championing the city’s strength in unity and the strength in saying yes to the city’s myriad ambitious projects.